EU’s agricultural and forestry land provides a wide range of public goods and ecosystem services on which society depends, yet land use decisions and society often under-value these. PEGASUS will develop innovative and practical ways of making public goods and ecosystem services concepts accessible and operational: it will identify how, where and when cost-effective mechanisms and tools for policy, business and practice can most effectively be applied to increase the sustainability of primary production. PEGASUS uses social-ecological systems as an analytical framework to explore systemic inter-dependencies among natural, social and economic processes. It will adopt participatory action research with public and private actors and stakeholders to better understand the range of policy and practical challenges in different case study contexts (localities, sectors, management systems, etc.). Throughout the project, we want to encourage a wide range of stakeholders – land managers, rural stakeholders and policy makers at local, regional, national and EU level – to get involved and share their ideas. An EU-level spatially explicit assessment of causalities between socio-political and institutional drivers, different land management systems and multiple delivery of public goods and ecosystem services will be complemented by fine-grained analysis within the case studies, and comparative meta-analysis will be applied to develop an operational framework for mapping, valorising and determining what public goods and ecosystem services provision is needed and feasible within particular territories and sectors. New data-sets, transferable methods and tools that are fit-for-purpose and sensitive to the plurality of decision-making contexts will be generated. An EU-level analysis of socio-political and institutional drivers, different land management systems and multiple delivery of public goods and ecosystem services was complemented by case studies as well as a mapping exercise to determine what public goods and ecosystem services provision are needed and feasible within particular territories and sectors. New data-sets, transferable methods and tools that are fit-for-purpose and sensitive to the plurality of decision-making contexts were generated. By improving recognition of the social and economic value of public goods and ecosystem services, PEGASUS promoted improved and innovative approaches to their provision by businesses and communities, and highlighted specific policy improvements to secure their delivery also in the longer term. The project provided specific advances in CAP, forestry and other relevant policies, underpinned by strong scientific evidence. Using the evidence gathered over 3 years of research, this article presents a summary of the key findings, messages and recommendations about ways to enhance the provision of environmental and social benefits by EU agriculture and forestry in the future. A series of factsheets has been realsed by the PEGASUS partners to present the issues faced in ensuring the effective provision of environmental and social benefits in different contexts (different ‘social-ecological systems’), by local stakeholders. 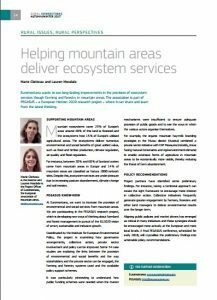 Euromontana was given the opportunity to explain why it was important for us to participate in PEGASUS and how the project results can contribute increase the provision of environmental and social services from mountain areas. Read the article in the December 2017 edition of the Rural Connections magazine, published by the European Network for Rural Development (ENRD). Pegasus releases a Toolkit to help stakeholders planning local initiatives to encourage more sustainable farming and forestry. Learning from examples around Europe, the H2020 PEGASUS project has identified a set of common principles and supporting methods to help actors at the local level who wish to enhance the environmental and social benefits provided by farming and forestry. 14 organisations are cooperating to ensure that the PEGASUS project objectives will be achieved. These organisations are based in 10 different EU countries and represent, for example, academia, research institutes and nature conservation partnerships.